CERTAINLY ONE OF THE MOST BEAUTIFUL LOCATIONS OF MARCHE REGION. On the top of a gentle hill with incredible 360 ​​° views and the Sibillini Mountains view, farmhouse to renovate of about 455 sqm and annexes. This property is truly unique and fantastic thanks to its enviable position, easily accessible and with a large garden for the recovery of the outbuildings and the creation of a swimming pool. The building has three floors for a total of about 455 sqm, completely to be restored. Probably requires a demolition and reconstruction with a better and personalized internal division and the creation of external portico. A few meters away from the main building there are two annexes to be restored for a total of about 117 sqm that could be converted into two depandances for guests prior authorization and verification in public offices. There is also a large barn, now partly collapsed of about 90 sqm, rebuildable for the construction of a large carport or storage. 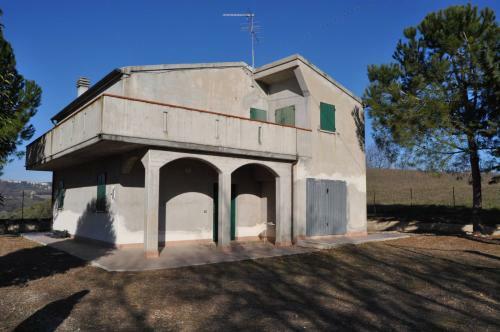 The property is about 3 km from the old town of Loro Piceno where you can find all the primary services and necessities. The beautiful beach of Civitanova Marche is only 40 km away. Also suitable for two families or for the realization of a receptive structure.